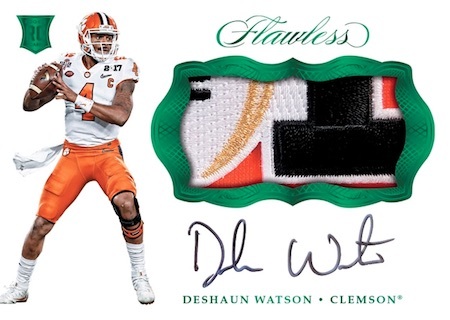 Taking the upscale brand to the college gridiron, 2017 Panini Flawless Collegiate Football has rarity and quality in mind with two gemstone cards and eight autographs or memorabilia cards per box. As many Flawless fans already know, the box itself is actually a metal briefcase. 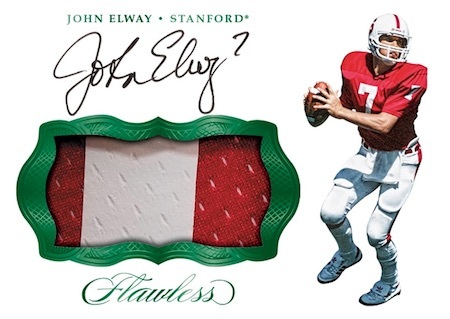 Although Panini's college line continues to grow, few sets can match the luxury elements in Flawless. 2017 Flawless College Football makes that very clear with only on-card autographs (or cut signatures) limited to 25 copies or less, along with relics and gem cards. A signature element of the brand, the 2017 Panini Flawless Collegiate Football checklist naturally includes "base" cards that boast embedded jewels. Base Diamonds are the most common at 20 copies, but there are also Ruby (#/15), Sapphire (#/10), Emerald (#/5) and larger Diamond (1/1) editions. 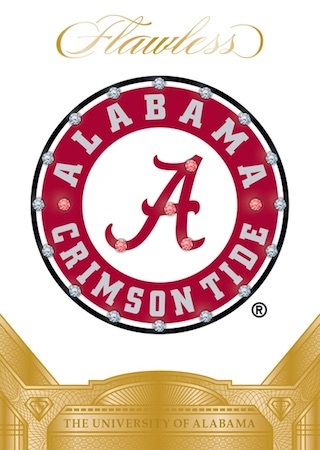 Opting for a school focus, Team Gems cards are all one-of-one releases for legendary programs such as Alabama and Ohio State. Hard-signed collectors rejoice as 2017 Panini Flawless Collegiate Football stays away from stickers. Celebrating the 2017 NFL Draft class are Rookie Patch Autographs for top names. The most desirable RPA options feature Bowl Game Logos, Brand Logos, Championship Patches or Conference Patches. First-year players also have Rookie Autograph cards. 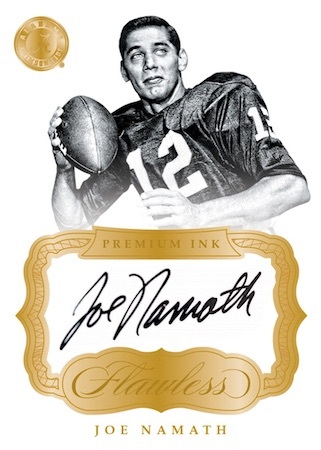 Premium Ink is for the all-time greats, and also provides Emerald (#/5) and Black (1/1) parallels. Applying a more personal touch, Team Slogan Signatures (#/25 or less) reflects fondly on the college days with a quote specific to the university. Similar to the RPA cards, Patch Autographs and Dual Patch Autographs both pair swatches and on-card signatures, but for the more established or retired players. Other autographed inserts include Dual Diamond Memorabilia Autographs and Team Logo Signatures. The Cut Signatures line features one-of-one cards for college legends like Red Grange and Jim Thorpe. Obviously for a different sport, the football layout is very similar to the 2017-18 Flawless Collegiate Basketball set. 2017 Flawless Evan Engram Auto Rc Serial # 1 1 True 1 of 1 !!!!! On Card Auto! KAREEM HUNT #’d 22 25 2017 Flawless Encased ROOKIE On Card Auto Gold CHIEFS! KAREEM HUNT #’d 11 15 2017 Flawless RUBY ROOKIE On Card Auto Encased CHIEFS! PARALLEL CARDS: Ruby #/15, Sapphire #/10, Emerald #/5, Diamond 1/1. 34 cards. Serial numbered #/20. PARALLEL CARDS: Ruby #/20, Sapphire #/15, Gold #/10, Emerald #/5, Black 1/1. 66 cards. Serial numbered #/25. PARALLEL CARDS: Gold #/10, Emerald #/5, Black 1/1. *Ezekiel Elliott, Andrew Luck, Richard Sherman, Troy Aikman, Ahman Green, Marcus Mariota, Hines Ward, Champ Bailey, Barry Sanders only in parallels. 18 cards. Serial numbered #/20. PARALLEL CARDS: Sapphire #/15, Gold #/10, Emerald #/5, Black 1/1. 22 cards. Serial numbered #/10. PARALLEL CARDS: Emerald #/5, Black 1/1. PARALLEL CARDS: Sapphire #/20, Gold #/10, Emerald #/5, Black 1/1. *Adrian Peterson, Tony Dorsett, Roger Staubach only in Gold, Emerald, Black parallels. PARALLEL CARDS: Sapphire #/20, Gold #/10, Emerald #/5, Black 1/1 (No Major Applewhite*). PARALLEL CARDS: Emerald #/5 (Antrel Rolle - 1/1*), Black 1/1. 17 cards. Serial numbered #/5. PARALLEL CARDS: Sapphire #/15 (No Luck, Peterson*), Gold #/10 (Andrew Luck - #/3*), Black 1/1 (No Smith*). 37 cards. Serial numbered #/10. Wow. Very cool checklist. Can’t wait to see the finished product. Crap checklist… brad Kayaa and some other junk. It’s missing 2 starting nfl rookie qbs. 3 actually now… garbage.. way too much attention to 5 teams… panini gets worse every set they put out.